British Columbia is most renowned for cosmopolitan and inventive Vancouver, also known as Hollywood of the North, and for quaint nearby Victoria. Both are nearly close enough to throw a stone from Washington State. So it’s no wonder then that one of the most popular U.S. culinary programs has carved out a campus in Vancouver for budding chefs and bakers across the border. But you’ll discover a couple of other leading culinary arts schools in Vancouver. Major Canadian cities include Toronto, Vancouver, Montreal, Ottawa, and Calgary. The country is an international melting pot of language, culture and foods. Regional cuisines weave a tapestry of traditional, ethnic and inventive fusions from street food to fine dining. French cuisine remains common as well as creative French-American dishes. 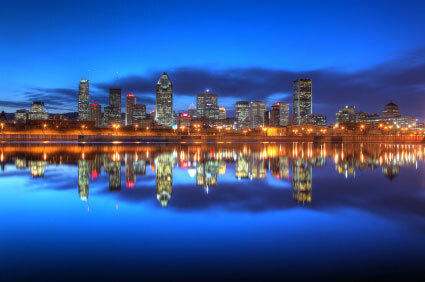 Study and live in Montreal and expect to be fluent in French, which is the primary language in Quebec province. But cities like Vancouver, Toronto, and Ottawa speak largely English. Venture into ethnic enclaves and you’ll hear languages from far-flung countries. The hospitality and food service industries are perennially booming north of the border, great potential if you’re seeking an international destination not that far from home. And if you’re into skiing or winter sports Canada offers some of the best slopes in the world. Economically the country is thriving, as well, which also fuels the career potential for qualified chefs. Get a passport and you’re as good as there. If you’re going to be studying as a chef in Canada you need to have a grasp of The Red Seal certification program. This government standard – The Inter-Provincial Standards Red Seal Program -- ensures vocational training like that of culinary and cooking schools, is standardized across the country. When a restaurant executive chef checks out your resume and sees that you’re a certified Red Seal chef, he or she knows that you have met certain industry competencies and been taught to a defined industry standard, regardless of your experience or ambition. To be certified you must take the Red Seal Certification test. International Culinary Schools at the Art Institute of Vancouver, BC is the only US-based AI program to venture into Canadian soil. Study a curriculum that trains you in international cuisines and culinary technique and offers on e of the more comprehensive selection of degree programs, indicative of the high demand for hospitality as well as chef professionals. Study: Advanced Diploma Culinary Arts and Restaurant Ownership, Advanced Diploma Hospitality and Business Management, Advanced Diploma Entrepreneurship and Restaurant Ownership, Culinary Arts Diploma, Baking and Pastry Diploma, Certificates Baking and Pastry 1 and 2, and Certificates Culinary Skills 1 and 2. Le Cordon Bleu Ottawa is located in the heart of Canada’s capitol and convenient to major travel hubs for international students. This is one of the most prestigious culinary curriculums in the world and based on the Paris model of the same name. Study classic French cuisine and cookery methods under the guidance of world-class chef/instructors and in state-of-the-art kitchens. Programs of study: Le Cordon Bleu Cuisine Diploma, Le Cordon Bleu Patisserie Diploma and Le Cordon Bleu Grand Diplome, an intensive combination of both. The Culinary Institute of Canada at Holland College in Charlottetown on Prince Edward Island is one of the most well-known Canadian culinary arts schools. And it should be: here is where Canada’s chef competition team, Culinary Youth Team, hails from. CIC attracts an international crowd of exceptional chefs-to-be and is located along Canada’s striking northeast coast. Programs of study: Culinary Arts, Pastry Arts and International Hospitality Management. Liaison College, in Hamilton Ontario is one of 10 campuses in the province. The school has earned a reputation as a culinary industry leader, with a popular chef-training curriculum to its name. Programs of study: Cook Basic Diploma, Cook Advanced Diploma, Hospitality Administration, and Personal Chef Diploma. Pacific Institute of Culinary Arts, Vancouver, British Columbia is top-notch and driven to put career-focused students into food service jobs with plenty of growth potential. Located in downtown cosmopolitan Vancouver, you have access to some of the best restaurants and hotels in the country. Study: Culinary Arts, Baking and Pastry, and Restaurant Management. Elliot House Restaurant and Chef School, or Mississauga Chef School, in Mississauga Ontario is a small pro and amateur chef training school and restaurant. If you’re a budding professional you’ll find small, intimate training and a proven curriculum. Curriculums are designed to cater to new student chefs as well as pros looking for renewed inspiration. Study: Professional Chef Diploma, Culinary Arts Diploma, Culinary Management Diploma, and an assortment of standalone specialty courses. Niagara Culinary Institute at Niagara College in Niagara-on-the-Lake Ontario boasts a campus on which you might lay the foundation for a prestigious chef’s career. Student chefs learn consummate culinary skills and cooking technique, in state-of-the-art kitchens, apply those skills to the on-site dining room, and in critical industry apprenticeships. Programs: Culinary Management, Chef’s Training/Culinary Skills, Baker Apprenticeship, and Cook Apprenticeship. Northwest Culinary Academy of Vancouver, BC is one of a handful of world-class culinary arts academies in Vancouver. Chefs Tony and Chrisophe own and design the curriculum, a unique delivery. Their goal: get you in, get you trained to expert levels and get you into a job. Programs are ultra-intensive: One Year Professional, Professional Culinary, and Professional Pastry/Bread. Constellation College of Hospitality in Toronto, Ontario is the epicenter for consummate hospitality training. Study amid some of Canada’s most luxurious hotels and resorts. Programs: Hotel and Restaurant Operations Diploma, Advanced Hotel and Restaurant Management, Fundamentals of Hotel and Restaurant Management, and Food and Beverage Management Diploma. Stratford Chefs School in Stratford, Ontario uses a teaching model that relies heavily on the study-while-you work concept. You are engaged heavily in apprenticeships in a variety of professional kitchen environments throughout the region and the country where you’re mentored and guided by accomplished chefs. Prerequisite is at least 6 months experience in a food service industry job before you apply. Programs: Chef Apprentice.